Genevieve Pink Ball Foundation(GPF) is a Non-Profit Organization dedicated to increasing Breast Cancer Prevention, Education, Screening and Treatment in Nigeria. GPF envisions a Nigerian society where “All Women” are knowledgeable about Breast Cancer and most importantly have access to Breast Cancer Screening, Counselling and Treatment. Our Organization has so far championed the fight against Breast Cancer through its PinkBall Benefit.Till date, we have successfully hosted two of such Gala events; the third PinkBall is scheduled for 18th October 2014 and as such, we have an initiative tagged: ‘100 Patient Challenge’. This initiative aims to provide free Surgery, Chemotherapy (TAC), Radio therapy and Breast Reconstructive Surgery to 100 patients (or as many as funding will allow). This year, we have a range of activities lined up to aid our cause and as part of this activity line up, we have the GPF Run/Walk/Cycle for Cancer which is scheduled to take place in Lagos on the 13th September 2014. 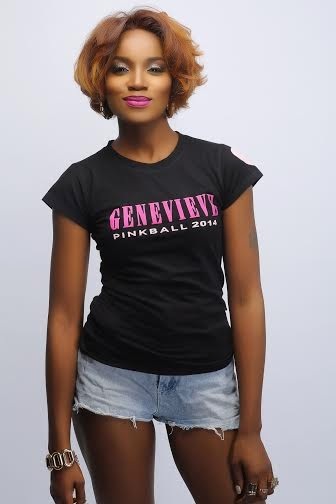 Celebrities involved in the Genevieve Pinkball Run/Walk/Cycle include the Pinkball Ambassador; Seyi Shay, alongside Michelle Dede, Betty Irabor, Annie Idibia, Juliet Ibrahim, Mai Atafo, Liz Yemoja, Bobby Taylor, Fade Ogunro, Toolz, Lynxxx, Juliet Ibrahim, Zainab Balogun, Eku Edewor, Lami Philips, Osas Ighodaro, Beverly Naya, Joselyn Dumas, Toke Makinwa , Ifan Michaels, Maria Okanrende , Dimeji Alara and more. The designated route: Lekki to Ikoyi and back to Lekki. This walk/run/cycle costs 5000 Naira for each participant to enter.